I am always amazed at how easily public discussion about scientific issues can degenerate into childish and nasty attacks on science, and scientists. This is especially true for internet discussion – this medium really does seem to bring out the worst in some people. Over the last few years we have seen climate science, and climate scientists treated this way. I have always tried to support that science, and those scientists, from afar and never thought I would become a victim of such nastiness myself. Then I got involved in the fluoridation issue. I am not critical of everyone who opposes fluoridation – some of my best friends oppose it. I can understand why some people will advocate personal freedom over social good. I can even understand the chemophobia and other misunderstanding which can make the less scientifically literate person a bit wary of fluoridation. But the anti-fluoridationists are a strange social mixture. Amongst the well-meaning environmentalists and health advocates there are some really irrational people. Conspiracy theorists are common. Some are concerned about chemtrails, others about Agenda 21 and attempts by the UN to control birth rates! Then there are the right-wing extremists, supporters of the US Tea Party Republicans, absolutely opposed to any community measure for social good. The anti-fluoridation movement is a strange mixture of left and right, concerned greenies and outright libertarians. One wonders what would happen to these groups if the fluoride issue disappeared and internal strife broke out. Unfortunately, it seems that quite often in the current controversy the more extreme conspiracy theorists and anti-science elements seem to be making the running. Speaking and acting for the more genuine members of the anti-fluoridation groups. I thought this only happened with teenage schoolgirls, or young female celebrities, but now find that even someone my age can become a victim. This video demonstrates the sort of attacks people who speak out about the science underpinning fluoridation can be exposed to. It really does put into context the decisions by local Health Boards not to participate in political meetings on fluoridation because of threats to, and attacks on, their staff. In a way, this sort of bullying is a bit of a compliment. Perhaps I have done something right to have upset these anti-science extremists. But it is not about me. This sort of thing illustrates the sort of nasty hysterical anti-science propoganda out there on the internet. The worrying thing is that this guy actually does have a following (about 9500 subscribers to his YouTube channel). When I expressed ignorance of who he is one commenter told me that “everyone” in Australia and New Zealand has heard of him! Yeah, right. But he is obviously popular with a certian group of people. Some of the myths promoted by anti-fluoridation activists really are of the “unsinkable rubber duck” variety. No matter how many times they are debunked they keep being repeated. If you follow the fluoridation debate at all you will have come across the “Harvard Study” “proving” fluoride makes you dumb. It is often associated with the claim that the Nazis used fluoridated water supplies in their concentration camps to distract the inmates. Some will even claim that this is the purpose for fluoridation in the US! In July 2012, anti-fluoride activists circulated an article from a journal called Environmental Health Perspectives (EHP) to support their claim that fluoride lowers IQ scores in children. There are several reasons why the claim being made by opponents lacks credibility. The EHP article reviewed studies on IQ scores for children living in areas of China, Mongolia and Iran where the water supplies have unusually high, natural fluoride levels. In many cases, the high-fluoride areas were significantly higher than the levels used to fluoridate public water systems in the U.S. In fact, the high-fluoride areas in these countries reached levels as high as 11.5 mg/L — more than 10 times higher than the optimal level used in the U.S. The Harvard researchers wrote in their article that the average standardized mean difference (0.45) in IQ scores “may be within the measurement error of IQ testing.” Despite web pages claiming that the article ”confirms” that fluoride reduces IQ scores, the Harvard co-authors did not reach a firm conclusion, writing instead that “our results support the possibility of adverse effects …” Indeed, their article called for more and better-quality research, including more “precise” data on the children involved and assurances that other factors have been ruled out as reasons for the IQ differences. Between the 1940s and the 1990s, the average IQ scores of Americans improved 15 points. This gain (approximately 3 IQ points per decade) came during the same period when fluoridation steadily expanded to serve millions and millions of additional Americans. The propaganda produced by anti-fluoridation activists reminds me of this cartoon. There are just so many examples of this in a flyer produced by the Fluoride Action Network of NZ (FANNZ) for the upcoming fluoridation referenda in Hamilton, Whakatane and Hastings. Here is just one small section describing the fluoridating chemicals used in New Zealand. They are, of course, referring to the most commonly used fluoridating, chemicals – fluorosilicic acid and sodium fluorosilicate. 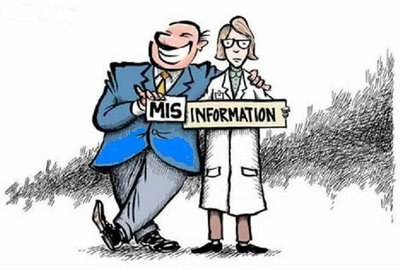 I have written about these chemicals, and the FANNZ misinformation on them before – see Fluoridation – are we dumping toxic metals into our water supplies?, Water treatment chemicals – why pick on fluoride? and Hamilton – the water is the problem, not the fluoride! . 1: Fluorosilicic acid is a by-product of the fertiliser industry in New Zealand. There is a market for that chemical (if only a relatively small one in New Zealand because we don’t have a fluoride industry) so it is not waste. Sure, in its concentrated form it is corrosive and toxic – as are all such chemicals. Including those used in water treatment like chlorine, sodium hydroxide, aluminium sulphate, etc. (see Water treatment chemicals – why pick on fluoride? ). 2: No, it is not food grade, neither is the chlorine, sodium hydroxide and alum used in water treatment. Because they aren’t used in foods – especially at those concnetrations. 3: Contamination with “mercury, arsenic, lead, cadmium and other heavy metals” is extremely small (see Fluoridation – are we dumping toxic metals into our water supplies?, Water treatment chemicals – why pick on fluoride? and Hamilton – the water is the problem, not the fluoride! ). Regulations define permissible levels of contaminants in our water supply and the chemicals used to treat it. They are based on known health risks of such chemicals and include large safety factors. Suppliers must fulfill these requirements, and provide certificates of analysis from independent laboratories, or the material is rejected. Those levels of heavy metals are extremely low. FANNZ has access to this information – a copy of this certificate was supplied to the local FANNZ representative by the Hamilton City Council. So why do they persist with this lie about contamination with toxic heavy metals? 4: No, it is not the same as naturally occurring calcium fluoride (CaF2). But when diluted in water fluorosilicic acid and the fluorosilicate anion decomposes to form the fluoride anion (F–) and silica. The reaction is driven to completion by removal of SiO2 from solution. The fluoride anion is exactly the same as that in calcium fluoride and a solution of dissolved CaF2. It is the F– species which provides the beneficial action to teeth and bones. 5: No it has never been tested for human safety at the low concentrations used in water fluoridation – for a very good reason. You can’t prepare a solution of fluorosilicic acid at these low concentrations because of its decomposition (see equation above). But, because it is hydrolysed to form F–, safety studies carried out with fluoride solutions prepared from chemicals like sodium fluoride and CaF2 are completely relevant. Remember, the fluoride anion is the fluoride anion, whatever its origin. Claim 1: The fluorosilicate does not decompose completely – it still gets into your drinking water and body. 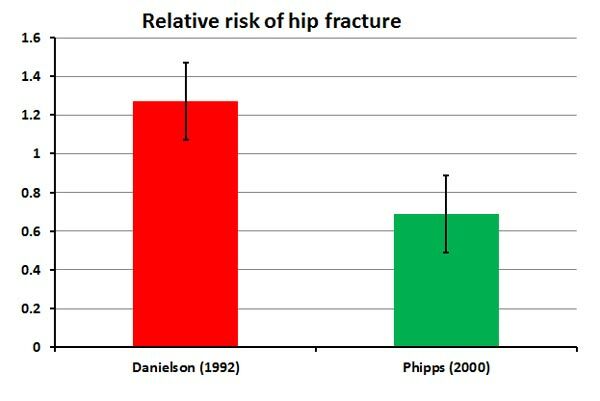 They will even quote Crosby et al (1969) who reported “that sodium fluorosilicate, at the concentration normally present in public water supplies, is dissociated to at least 95%.” The activists choose to interpret “at least 95%” to mean they have 5% to point to, and not representing any margin of error in the data. There have been a number of studies specifically for checking the completion of hydrolysis of fluorosilicate anion at low concentrations. Although equilibrium measurements indicate complete hydrolysis it was necessary to make sure that kinetic factors did not inhibit the reaction. As a chemist I find this confused but several anti-fluoridation activists have made that claim to me. Fluoride exists in solution as the hydrated F anion – not directly connected to a cation as in the solid crystal. Effectively it is independent of the cations in solution. Sure, if there is excessive Ca2+ then CaF2 crystals will precipitate. And other ions could also promote removal of other insoluble products. But in solution fluoride is fluoride is fluoride. It is not influenced by its origin. Really, this sort of gobbledygook is just an attempt to avoid reality. It is not science. Hamilton – the water is the problem, not the fluoride! Yes, that would be convenient, wouldn’t it. 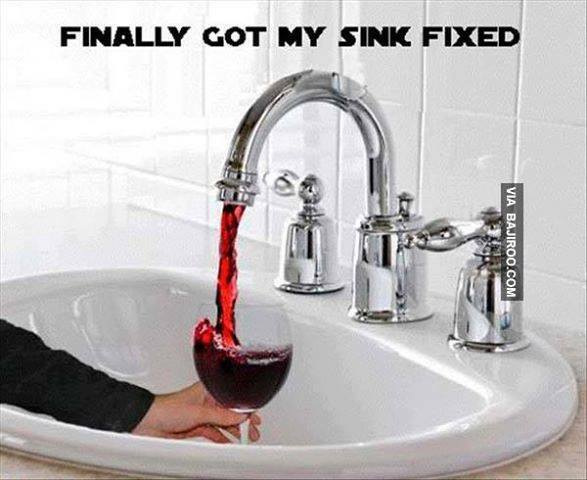 Instead of Hot and Cold taps, why not Red and White? However, there is an element of truth in the joke. To some extent, the Waikato water is the problem, rather than fluoride added during fluoridation. 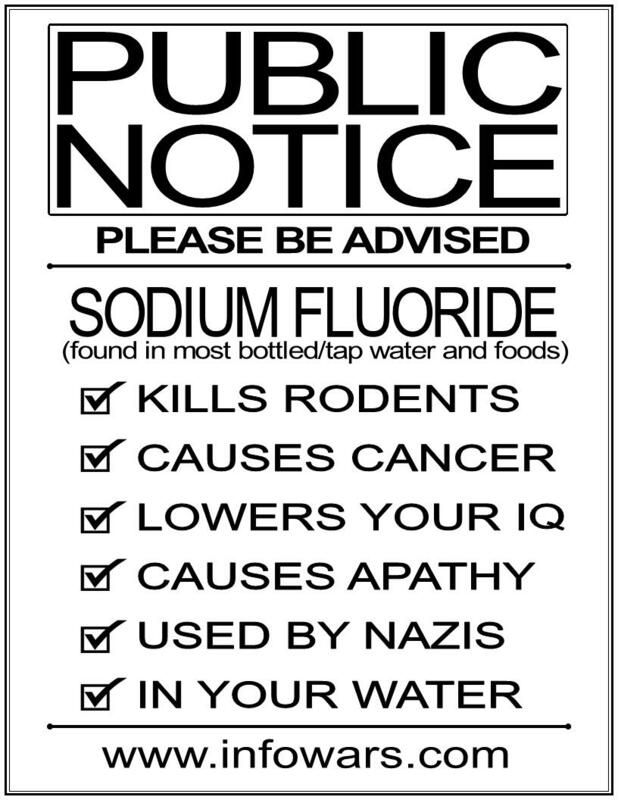 Anti-fluoridationists are concentrating on the “evils” of the fluoridation agent, fluorosilicic acid, without realising that the source for our water supply in Hamilton introduces more contamination than the fluoridation chemicals. 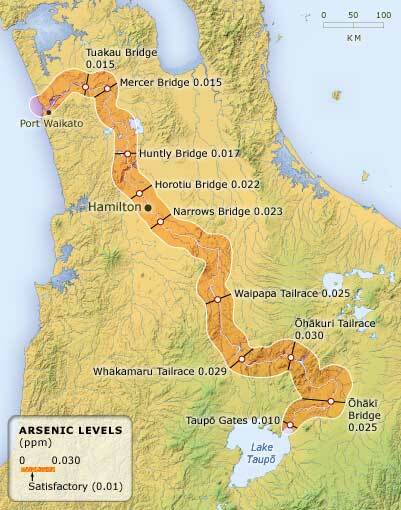 Have a look at this graphic showing the levels of arsenic (As) in the Waikato River. Through almost the entire length of the river As levels are several times higher than the recommended maximum concentration for human consumption which is 0.01 parts per million (ppm). The source water for the Hamilton water treatment plant is 2 or 3 times that recommended maximum As concentration. Fortunately the treatment process remove about 80% of the As. Let’s compare that with the contamination introduced by fluoridation chemicals. 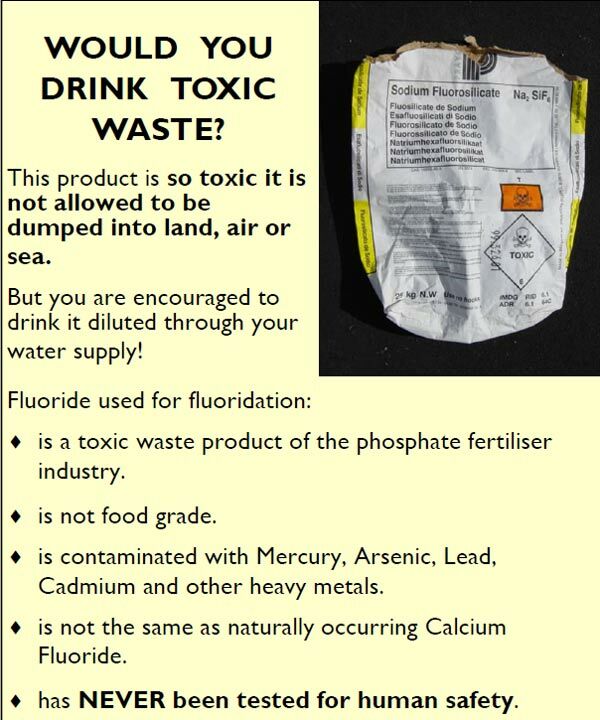 A typical concentration of As in fluorosilicic acid is 2 ppm (see Fluoridation – are we dumping toxic metals into our water supplies? and Water treatment chemicals – why pick on fluoride?). 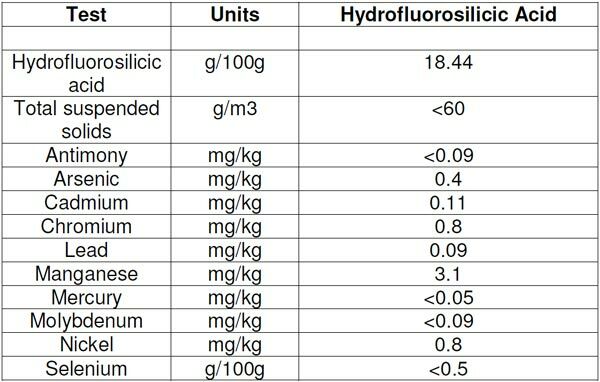 There is a large amount of dilution of the fluorosilicic acid when added to water at the recommended dose (0.7 – 1.0 ppm). The final concentration in our drinking water is 0.0001 ppm As. Several orders of magnitude lower than the maximum recommended concentration for human consumption. In reality, even after removal of 80% of As from the source water the major contribution to any As contamination in Hamilton’s public water supply is the Waikato River itself – not the fluoridation chemicals. By several orders of magnitude. * see Fluoridation – are we dumping toxic metals into our water supplies? and Water treatment chemicals – why pick on fluoride? Haven’t the Hamilton anti-fluoridation campaigners got their priorities wrong when they complain about contamination of the fluoridation chemicals used? Trouble is that is just wrong. I shows the council did not learn anything about the mechanism of fluoride protection against tooth decay from their recent hearings . Worse, they are confused – and are passing on their confusion to their citizens. I discussed this issue of the topical mechanism in my article Fluoridation – topical confusion. But I guess it bears repeating because the Hamilton City Council is not the only group confused about this. And the anti-fluoridation activists are working hard to spread that confusion. When the word “topical” gets mentioned in this situation we need to understand clearly this refers to the mechanism of inhibiting mineralisation – not to the method of application. The topical mechanism is the major one preventing decay of existing teeth at all ages, it operates at the tooth surface ( and just below) and relies on having a relatively continuous low concentration of F in the saliva and biofilms on the teeth. Fluoridated water (and fluoride in our food) participates in that mechanism of protection. Some of the fluoride in the drink and food gets transferred directly to saliva, and thence the tooth surface – during consumption. Anti-fluoridation activists attempt to confuse the issue by talking about fluoride which is ingested, metabolised and then excreted from the salivary duct at a concentration lower than in fluoridated water. That fluoride has little effect at the tooth surface – because of its low concentration. It is the fluoride transferred directly to saliva during the act of drinking (or consumption of food) that provides a sufficiently high concentration to have a protective effect. That is, F is transferred to the saliva, and then biofilms, during drinking and eating – something we do regularly. The concentration in saliva spikes and then declines over an hour or so. Tooth decay occurs because when the pH at the tooth surface is lowered (this happens bacteria decompose sugars) some of the the calcium hydroxy apatite at the tooth surface dissolves – mineralisation. With time the pH increases and the reaction is reversed – calcium and phosphate ions at the tooth surface reform as the solid hydroxy apatite (remineralisation). When fluoride is present at the tooth surface a fluorohydroxy apatite is formed. This is “harder” – it doesn’t dissolve as readily. Consequently the incorporation of fluoride into the tooth surface reduces mineralisation – and enhances remineralisation. It inhibits tooth decay. It turns out that F in fluoridated water and food does this very effectively. And, because we drink and eat often, dietary forms of fluoride help to maintain a useful concentration of saliva fluoride over time. Topical application methods (toothpastes and dentrifices) are a supplement to fluoridated water and dietary fluoride, but not a substitute – partly because they are not applied as often (if at all). 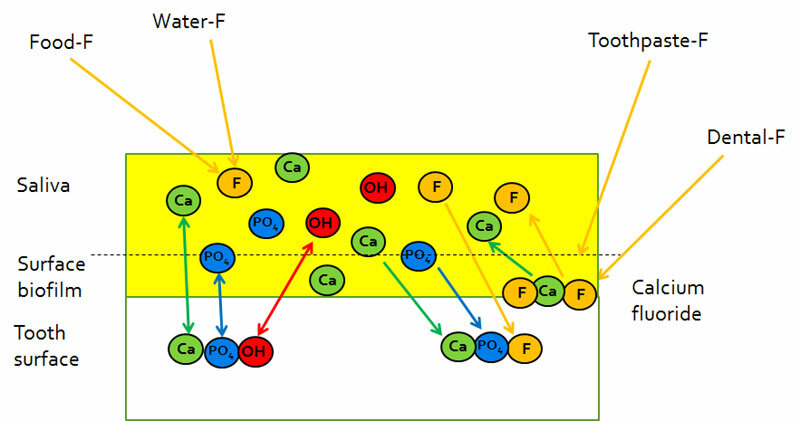 Even here it seems their mode of operation may be by the formation of CaF2 globules on the tooth surface (because if the high F concentration) which then slowly release their F over time to maintain saliva concentrations at an appropriate level (see the review article Mechanisms of Action of Fluoride for Caries Control by Buzalaf, Pessan, Honório, and ten Cate JM (2011)). This topical mechanism which operates with fluoridated water means that the whole population can and does access the “topical mechanism” without thinking about it. Unfortunately the anti-fluoride lobby are spreading a lot of misinformation about the word “topical.” And, now, so is our local City Council. Hamilton City Councillors came in for a lot of criticism after their shock decision to end fluoridation. In their defence they claim their consultation process (“The Fluoride Tribunal”) gave them then information they needed – and the process was “robust.” (That word “robust” is the latest trendy word at the council these days). But the fact they are repeating this mistaken description of the topical mode of fluoride protection against tooth decay shows it was far from “robust.” Despite all their efforts – and the large number of submissions, the council got it wrong. I have watched many of the videos of submissions I know that the group of experts from the Waikato District Health Board and Ministry of Health did explain this topical mechanism. I know they explained it clearly. So why did the “tribunal” get it so wrong? The expert submissions were swamped by the submissions from anti-fluoridation activists (about 90% of the submissions). Many of those repeated the misleading interpretation of the topical mode of action. The Council had set itself up as a “tribunal” (my dictionary describes that as a group “with the authority to judge, adjudicate on, or determine claims or disputes.”) They were assuming they had the power, knowledge and ability to make an authoritative judgement of the scientific evidence set before them. The council appeared to give at least equal credence to “both sides” – councillors often referred to hearing evidence from “eminent experts on both sides.” Apparently an academic title was enough to show credibility in the eyes of these councillors – no attention being paid to the submitters background, specialisation or research experience. Worse, some of the councillors appeared to give more credence to the anti-fluoridation submitters than the District Health Board and Ministry of Health experts. 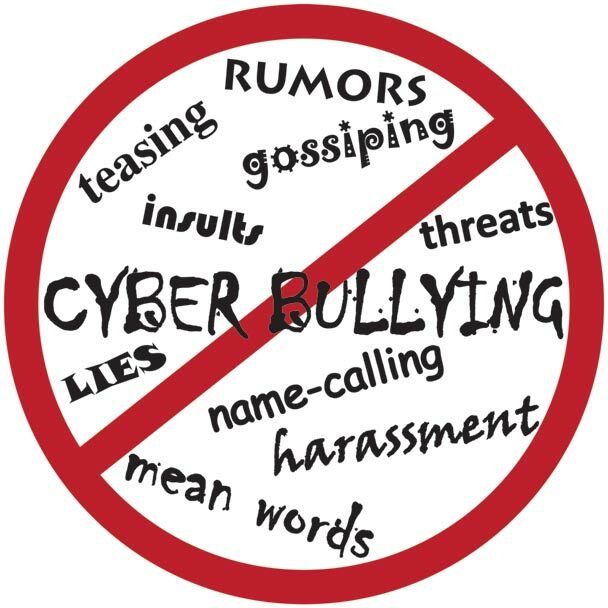 A telling comment from one councillor was his reference to attempting to balance information from “experts who do no research and non-experts who do all the research.” His concept of research seemed to be internet Google searching and listing multiple but unsubstantiated claims. I experienced hostility from several councillors who were very dismissive of any reference to science. It seems to me the sort of consultation set up by the Hamilton City Council was poorly thought out. It should never have been seen as a “tribunal” set up to make judgments about the science of fluoridation or possible health problems. The council members just do not have the scientific ability – or indeed the necessary skills in critical thinking, to make judgements in such a complex area. They could not produce a decision reflecting the best judgment of the evidence – and indeed they didn’t. Their document purely listed common arguments presented by submitters. There was no assessment of credibility, evidential support or confirmation. If an assessment of the current science around fluoridation was really required then this should have been done by appropriate professionals – not politicians. The council should have relied on such an expert review, or in its absence, the recommendation of the proper experts. Instead they set themselves up in judgment of the complex science – and took evidence from some of the most inappropriate sources. 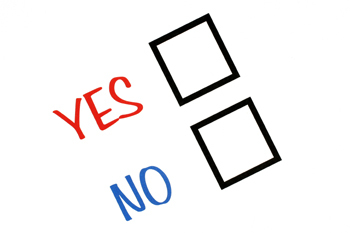 In the end, a referendum at the next local boy elections was the only way to resolve the pickle they had got themselves in to. Hopefully the new council will not make the same sort of mistakes about fluoridation advice.